A friend recently directed me to a Time interview with Avraham Burg, author of The Holocaust Is Over: We Must Rise from Its Ashes and scion of one of Israel's founding families — his father was the deputy speaker of the first Knesset, and Burg himself later became speaker of the legislature, and a member of Israel's cabinet. In this book, and the Time interview, Burg argues that the Jewish people – both in Israel and the diaspora – are in a state of crisis partly because of the extent to which the Holocaust dominates contemporary Jewish identity. Burg's insights are not only poignant in light of current events – the invasion of Gaza dominating the news every night for over a week, as of this writing – but also because he addresses the psychic impact that Israel's fixation on the Holocaust has on its ubiquitous victim complex. And, by extension, the disservice done when modern threats are contextualized in this historical mold. Burg tells Time: "The Holocaust is a very real trauma for many people in Israel, and nobody can argue with that. But ... when I hear someone like Benjamin Netanyahu, who is a very intelligent person, say of [Iran's President Mahmoud] Ahmadinejad, 'It's 1938 all over again,' I say, is it?! Is this the reality? Did we have such an omnipotent army in 1938? Did we have an independent state in 1938? Did we have the unequivocal support in 1938 of all the important superpowers in the world? No, we did not. And when you compare Ahmadinejad to Hitler, don't you diminish Hitler's significance?" Burg's comments set my mind back to the fallacious comparison of Iraq, Iran, and North Korea to Nazi Germany and Imperial Japan – an comparison of axes that infamously over inflated the perceived threat of the former while trivializing the later. I do not mean to suggest that such modern menaces are unimportant, only that there is a distinct difference between gangsters and devils that must not be obfuscated through rhetoric. But Burg's interview with Time also reminded me of a 2005 Frontline piece about the place of the Holocaust in modern German identity. I was especially struck, in this regard, by Burg's laments over damage done to Israeli culture by this fixation on trauma: "Look where we were 100 years ago and look where we are today — no other people made this transformation. Imagine we did not keep the shadow of the trauma looming over ourselves daily, what could we have been? How come 25% of the Nobel laureates in certain fields are of Jewish origins, and 10% of the arms deals around the world are done by Israelis? Why is my brother or sister in America a great poet or composer or physician whose achievements raise up all of humanity, and I who live here on my sword became a world expert on arms and swords? Is that really my mission, or is that an outcome of the black water with which I water my flowers? To make our contribution to humanity, we have to free ourselves of the obsession with the trauma." 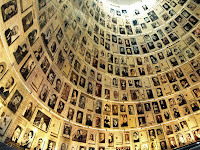 He also criticizes the use of the national Holocaust memorial, Yad Vashem, as a political tool: "The sad thing is that whenever a head of state begins a visit to Israel, he doesn't go to a university or to the high-tech sector or the beautiful cultural places we have in Israel; first you should get molded into the Israeli reality at [the Holocaust memorial] Yad Vashem. And I do not think that Yad Vashem should be the showcase or the gateway through which everybody should first encounter Israel. Part of the program, yes; but the starting point? This is not the way to baptize people into an encounter with Judaism ... It's an emotional blackmail that says to people, this is what we have experienced, so shut up and help us... When the sages created the national holiday of Tisha Be'av, they made it the single day on which we commemorate all the traumas of our history, from the destruction of the first temple to the Spanish expulsion. These events did not all happen on this exact date; the founders of Jewish civilization confined the memory of the traumas of our history to one day, to allow us the rest of the year to get on with being Jewish, rather than letting sorrow take over our entire existence..."
The issue that Burg appears to be driving at is how can a modern nation creative a positive, forward-looking future for itself in the shadow of such pain – and its associated guilt. This is a question that PBS's Frontline tacked from the other side back in 2005 with their documentary "A Jew Among the Germans." Only, where Burg argues that the Holocaust's centrality in Israeli identity creates a dysfunctional society, Frontline explores how the German Memorial to the Murdered Jews of Europe impacts German identity. Dr. James Young, a scholar of Holocaust memorials worldwide and a judge for the second memorial competition in Berlin, tells Frontline, "Countries don't build monuments to their crimes. In America, we have not built monuments to ... how do you reunite a divided country, in this case a divided city, on the bedrock memory of national crimes?" This is not to argue that such a national focus – in either the perpetrator or victim state – is necessarily a destructive condition. 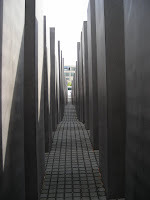 The Berlin memorial's designer, Peter Eisenman, argues that the German monument is, instead a foundation for healing. He tells Frontline, "It starts— like, in the sidewalk, there are little slabs. Each slab is 92 centimeters. There are 4,000. They're all lined up in rows, like the Nazis ... The whole idea is rationality gone mad, entropy entering rationality. You go and walk in it, and you will feel uncertain, you know? These things are tilting. I don't know where I'm going. Am I going to get lost? I'm alone. I can't hold anybody's hand. And that, when they get done, was what it felt like to be a Jew in Germany in the '30s ... We want to get over this idea of the Jew as Other. So my monument is both a memory and a hope for the future. And it's to bring the Jewish cemetery into the everyday experience of the German, in the middle of the city. But also, it could be a series of— if you look at them, they're foundation stones for a new society." The issue of how we choose to remember the past – especially the tragic and ignoble episodes in our own national stories – is one of the core problems of national identity as well as history. Is it possible for an Israeli to contextualize their state without identifying with the Holocaust or the Arab-Israeli conflict? Is it possible for a German to contextualize their reunited nation without acknowledging the sins of their ancestors? The trick is to build a future without guilt, be it imposed or embraced.